Experience some of the world's most famous thoroughbred farms and equine related facilities. Our tour focuses on getting out and going into barns, talking to the groomsmen and feeding the horses peppermints. We go to private horse farms only. On this tour your small-group will see some world-renowned Bluegrass horse farms up close and personal with plenty of interacting with these beautiful and elegant animals. Enjoy roughly 2 1/2-3 hours with us, so we can show you our city and the inner workings of some of the most famous names in the horse breeding industry. Departing from Embassy Suites Lexington located at 1801 Newtown Pike in Lexington Kentucky. Board our air-conditioned bus and we will set off on our 2.5 – 3 hour horse farm adventure, while taking in the sights this region has to offer. This tour features approximately area 3 attractions such as Katierich Farms, Hill ‘n Dale, and a lot more private farms or visit a horse hospital. Shaun the best tour guide hands down will show you an amazing experience. 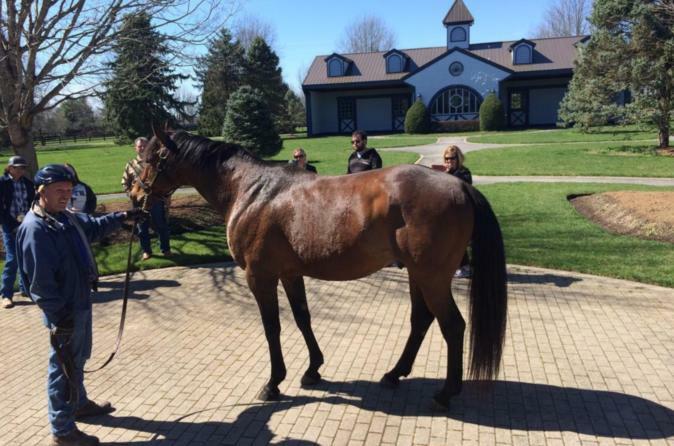 At these amazing locations we will be involved with activities such as feeding horses peppermints and seeing the babies such as the nicest American Pharoah foals. Many of the farms we visit have been operated by families for generations and are typically closed to the public. We've developed relationships with these farms and can provide you with a peek at the inner workings of some of the most famous names in the horse breeding industry.